Ask me a Thai dish and the first that comes to mind is Pad Thai. I know it's the easiest to remember, it has Thai in it's name! So it's not when I dine for the first time to any Thai restaurant, the first dish I order is Pad Thai which is exactly what I did when we dined at Silk Road. Silk Road Thai Bistro is a modern Thai restaurant located at NetQuad Building at Bonifacio Global City, very near St. Lukes. The resto looks intimidating from the outside (read: it looks expensive) but one taste of their dish would be enough to prove the food is worth the price. Introducing Silk Road's famed Pad Thai. 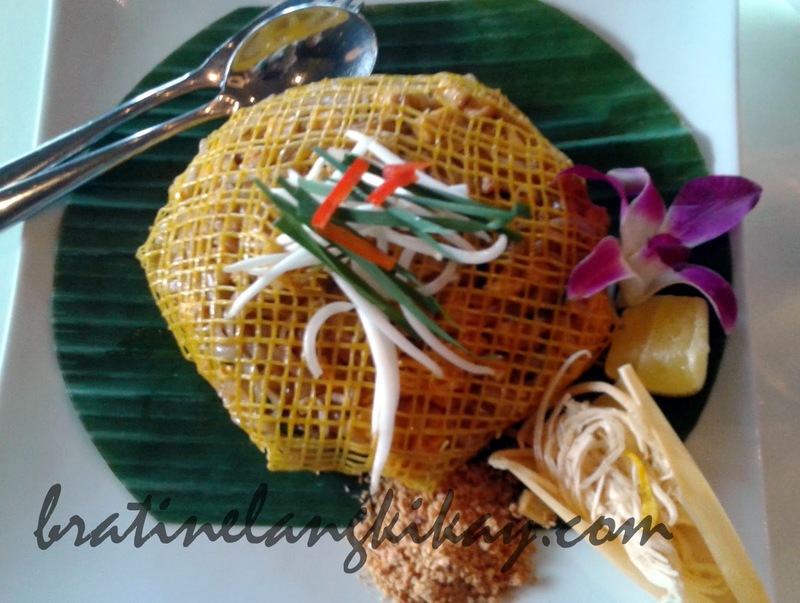 The famous Thai noodle dish is served wrapped in a net of scrambled eggs, adorned with veggies on top and crushed peanuts and lemon on the side. I gasped when the plate touched our table and I saw the beautiful ensemble. It's a sight to behold that I didn't even want to eat the dish anymore! I liked how the peanut was served on the side instead of being mixed into the dish. This gives diners an option to go easy on them or to avoid peanut altogether. I find squeezing a dash of lemon as the noodles and egg net are mixed together enhances the already-perfect dish. One order priced at Php340 is good to share by 3 people but it's too yummy that maybe the entire plate is just enough for 2.